5 reasons why Jon Jones will keep eye poking opponents. Discussion in 'UFC Discussion' started by GearSolidMetal, May 29, 2014. 1. Of all the fights he's 'accidentally' poked his opponents eyes (4 in one fight, I believe) he has not suffered a single point deduction. 2. He gets a break in the middle of the round for every time the referee stops the fight to check his opponent's eye and make sure he's fully recovered. 3. Opponents are more fearful of moving in, and staying out of Jone's range, and he theirs, after being poked in the eye. 4. When confronted of this dirty tactic, he (or Dana being his mouthpiece) can play the victim, that only Jones's 'Haters' criticize him for doing this. So, yeah, despite Dana White's comment 'they go to stop' unless Jones has some kind of consequences for a dirty tactic, don't expect to 'see' a change of strategy anytime soon. JUST ADDED - 5. Eye pokes can seriously disrupt his opponents ability to see. It's been documented that fighters, after eye pokes were received and fight was continued, had suffered blurry vision, which can effect the entire fight. Not being able to see incoming strikes or takedowns as well as they would have before the eye poke/s. And this issue is exasperated the more eye pokes are received both eyes. One warning and then a point deducted each time. It's the ref's job to do something about it. It's because he's used to doing it, and it's effective, and there's no punishment. Yeah, they gotta start taking points away if he keeps doing it. Refs not enforcing the rules. Fighters should just land groin shots on him if he even sticks his fingers out. 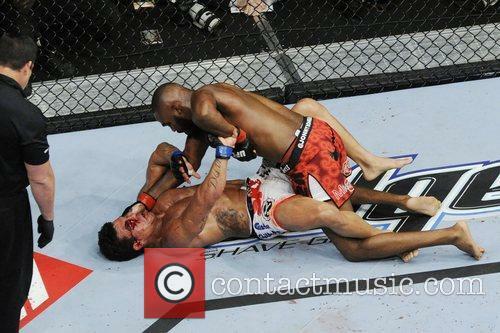 Did Vitor get eye poked? Basically sums up my entire OP, but the OP outright says the advantages of intentially poking your opponent in the eye. no warning. he already knows not to do it. why give him one freebie? The day that he gets knocked stiff as a board is going to be a glorious moment of humble pie. Can't wait. The longer it takes, the sweeter it will be. 2) it works. very well. Exactly my take. He doesn't need the dirty stuff, wish he'd cut it out. The main reason is JJ is one of the dirtiest fighters around just like when he was elbowing shogun in the throat in there fight. It's as much the refs fault as his...he's been allowed to get away with it so much that it actually became a "good" habbit in some ways, I doubt he means it, it's just a reaction now as he hates being hit.